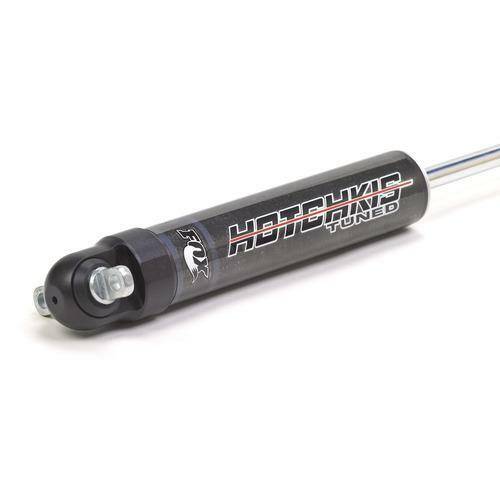 The Hotchkis Tuned, 1.5 Street Performance Series shock absorbers by Fox, are specifically tuned by Hotchkis ride engineers for a smooth ride and exceptional control for your Muscle Car. The Hotchkis Tuned shock absorbers feature the latest, cutting edge mono tube shock technology in a lightweight, smooth-bore, type III hard anodized aluminum body. The shocks feature, smooth riding, digressive disc technology, a high-flow piston, specially formulated oil, and high pressure nitrogen for consistent performance under varying conditions and temperatures. Each shock is application tuned to offer superior ride comfort and excellent vehicle control. For extended durability the shocks feature ½” hard chrome plated, heat treated alloy shafts, subjected to 100 hour salt spray testing. To prevent contaminants from entering the shock, the rod guide employs a wiper/scraper dual seal which cleans the shaft before reaching the main seal. The heavy duty black anodized end caps are CNC machined from 6061-T6 billet aluminum. For superior shock control and vibration damping polyurethane bushings are installed at each end. CNC machined cross bars, and Muscle Car specific mounting hardware make these shocks a direct easy to install replacement. Bolt-on Hotchkis Tuned shocks and feel a significant Muscle Car improvement.